Southeastern San Diego may not be on many travelers’ radar yet, but this hidden gem is one of San Diego’s most culturally diverse regions. 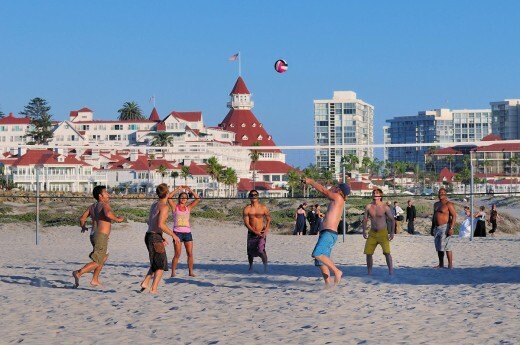 Located about 5 miles from downtown, the neighborhoods of Southeastern San Diego are easily accessible by the San Diego Trolley and offer lots of ways to see, hear and taste the many facets of life in America’s 8th largest city. With a variety of African and Asian residents, Southeastern San Diego features numerous festivals throughout the year where visitors can immerse themselves in authentic cultural experiences. The annual FilAmFest is one of the region’s most popular cultural festivals, and features live entertainment and cuisine from the Philippines. Held at Market Creek Plaza, the Somali American Cultural Fest is a colorful celebration filled with signing, dancing, poetry and more. Every April, the Wat Lao Buddharam temple hosts Boun Pimai, a Lao New Year celebration featuring a processional with traditional music. 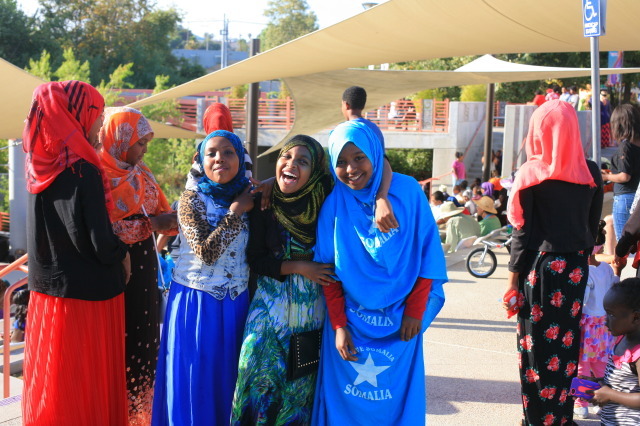 The Somali American Cultural Fest is just one of many colorful cultural events held each year at Market Creek Plaza. The Jacobs Center for Neighborhood Innovation has helped the Southeastern community turn their neighborhoods into outdoor galleries thanks to lots of public art on view at and near Market Creek Plaza. 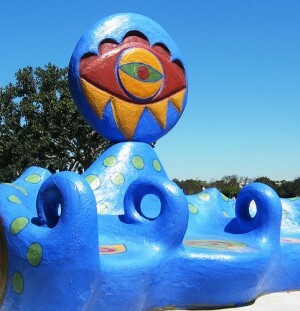 The amphitheater at Market Creek Plaza features special artistic touches, including bronze sculptures of children at play and the Sempra Childrens’ Art Wall, a bright mosaic of hand-painted tiles decorated by local children. The many smiling faces gazing down at visitors to Market Creek Plaza are part of the Community Faces Project, a series of murals celebrating local leaders. Just down the road from the plaza is Writerz Blok, a park devoted to graffiti art. In addition to offering local artists and youth a place to experiment with contemporary art practices, Writerz Blok is a remarkable sight to take in. September is Arts Month here in San Diego, and we’re celebrating with everything from art walks to film festivals. But regardless of what month you visit, San Diego is a top destination for lovers of all forms of art. 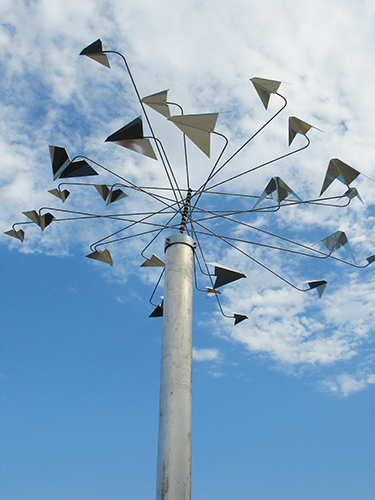 Some of the city’s most intriguing artworks take a little bit of sleuthing to discover. Fortunately, you’ve got your own personal guide right here! 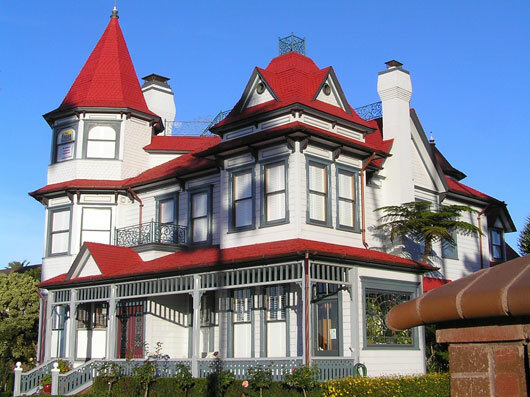 Join me for a video tour as I search out some of San Diego’s hidden artistic treasures. 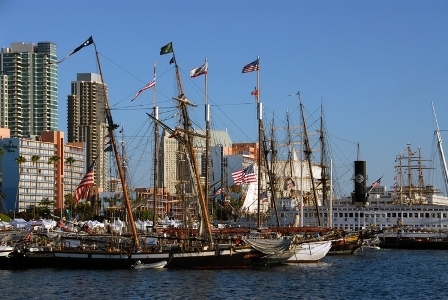 Starting tomorrow, the Maritime Museum is offering free, guided Historic Walking Tours along San Diego Bay. The tours will last 45 minutes to an hour and be offered twice a day on weekends at 11 a.m. and 1 p.m. 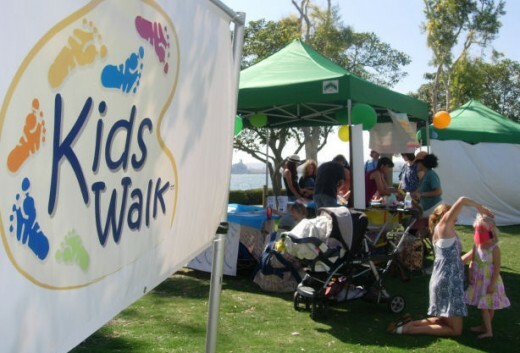 Sponsored by the Port, they’ll cover about one mile of the waterfront beginning in front of the USS San Diego Memorial at the foot of G Street and Harbor Drive, just south of the USS Midway Museum. 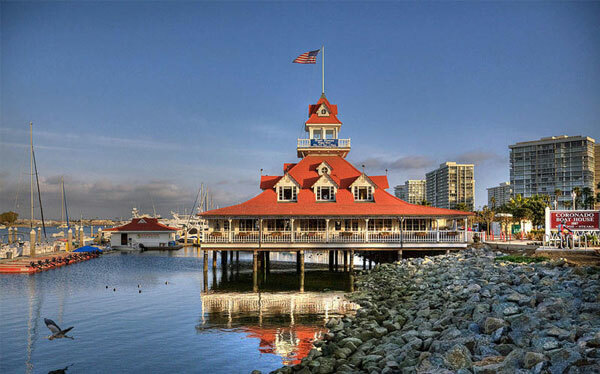 Along the way, tour guides will point out and share the history of gems like Seaport Village, the Midway, our Urban Trees – you know I’m a fan of them – and all the military heritage art at Tuna Harbor Park – which we’ve also shared with you here before. If you’re out and about you can spot tour guides on Saturday by looking for a blue and white Maritime Museum flag. Tours are first come, first serve and will be held through the end of June. Of Stephenie’s 5 to Try This Weekend, here’s the one I tried — #1. When you consider all the public art along downtown San Diego’s waterfront — from the temporary and seasonal to the permanent collections — it’s clear the Port Authority of San Diego is committed to art as a way to keep the waterfront dynamic and its visitors stimulated. 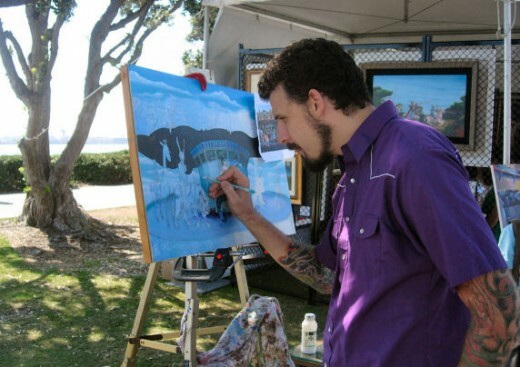 Each year, ArtWalk on the Bay celebrates that spirit by packing as many artists and art pieces into Embarcadero Marina Park North (right where Seaport Village is) as possible, along with art teachers, musicians (on two stages), and even demonstrations from culinary artists. 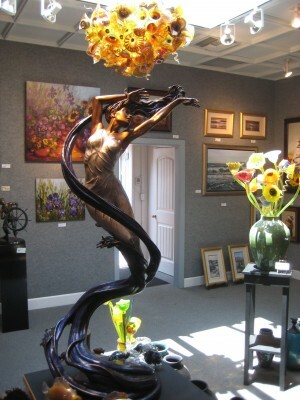 Here are some scenes from my art walk today — day one of ArtWalk on the Bay 2009. You won't miss the herd of large, iron creatures in motion greeting you on your way into the festival. Attention future painters, sculptors, mask shapers and kite makers: Start young! Start here! Beat it, kid! 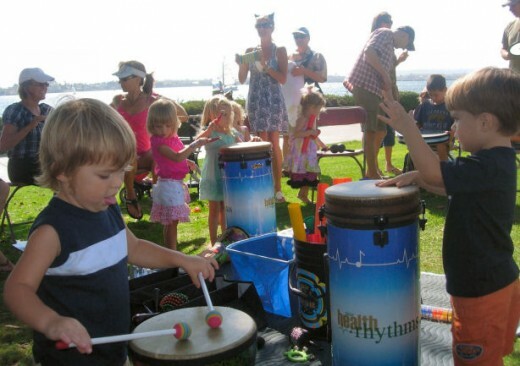 KidsWalk drum circles are led by Susan Hall of RhythmWorx, and they're a blast. And look! 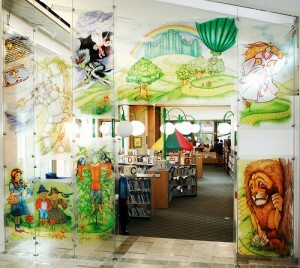 Real, live artists creating real, live art before your very eyes! This is Michael Summers, painter, painting. This was just a small taste of day one of ArtWalk on the Bay. 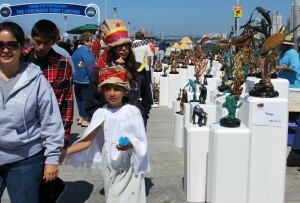 The art festival stretches all along the Embarcadero North, and there’s still one more day to go. The festival starts again Sunday at 10:00 A.M.
A tip for those of you not taking advantage of our great public transportation system to get to ArtWalk: Seaport Village offers the closest parking but it’s best to get there before noon for a good shot at that parking lot. Otherwise, since there is no parking enforcement on Sunday, grab any of the metered parking spots along Harbor Drive and save your change. 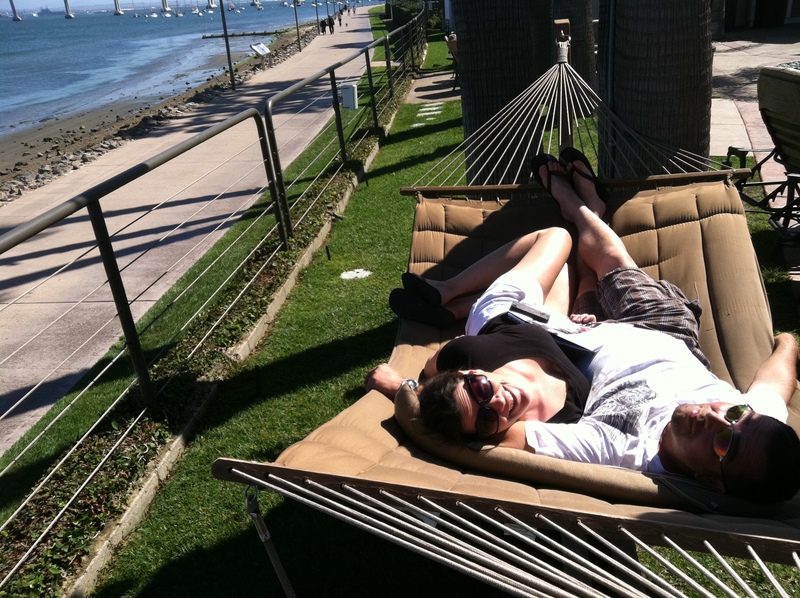 Popcorn Chicken is one of the 30 new Urban Trees on San Diego Bay. 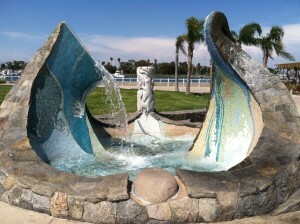 My perennial favorite public art project is blooming again along the shores of San Diego Bay. 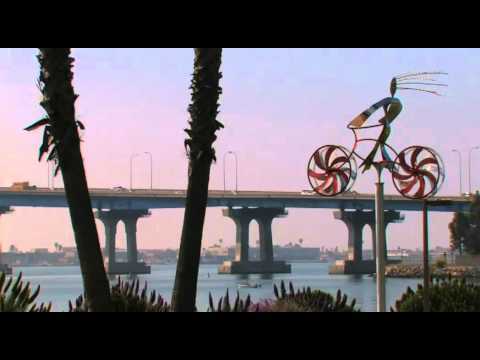 Each year since 2003, the Port of San Diego has commissioned artists to dream up fantastic, fanciful sculptures and install their “urban tree” on our waterfront. Over the years, the Urban Trees project has produced works of art that range from literal to surreal to kinetic to musical to just plain silly. What does Urban Trees version 6 have to offer? Well, the trees are installed, the Port has posted a handy google map to guide you and they are definitely worth a leisurely stroll along the Bay to check them out. Paper Airplanes are pretty, no? 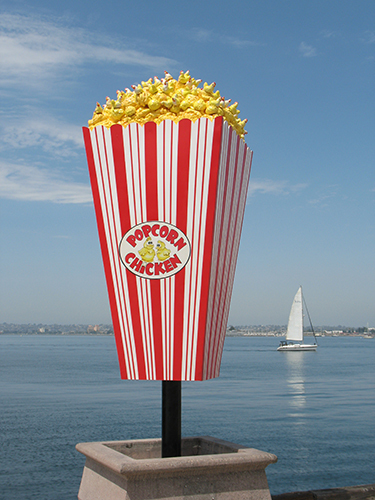 Pop art crops up in “Popcorn Chicken” a 10′ tall red and white striped popcorn box filled with, you guessed it, chickens. “Chemis-tree” gives a nod to San Diego’s biotech industries with a colorful, rotating double helix. But my favorite is “Paper Airplanes” – a squadron of polished metal ‘paper’ airplanes perched on delicate stems and rotating in the breeze. It’s graceful and beautiful but it also reminds me of being a kid and long lazy afternoons lost in imagination. 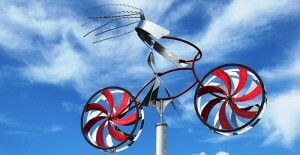 A little whimsy – it makes me smile!